The fluffy and lightly sweet rolls that keep everyone coming back to Texas Roadhouse that can now be made at home! Our family has made the move to Utah and we’re up and running with the internet! Woo hoo! I was starting to feel lost there for a bit. This last weekend was a busy one trying to get everything from our home in Idaho to our new place in Utah. We had a lot of people helping us this weekend and we really appreciate everything that was done for us to get us here. We have the greatest friends and family ever. One of my favorite things about Texas Roadhouse is those darn rolls. Wow, those things are deliciously dangerous. There’s no way I can eat just one…basket. Seriously though, they’re amazing. I’d like to thank the person who came up with the idea to serve those lovelies to the guests as a starter. Bless you. My husband and I treated my mom and sisters to Texas Roadhouse this last weekend for helping us so much with moving. When we sat down with those rolls in front of us I remembered that I have a copycat recipe for them that I’ve been needing to share. So let’s get to it! Place milk in a saucepan over medium heat. Bring to a boil and remove from heat. Allow to cool to room temperature. Melt the butter in the microwave and set aside. In a stand mixer with the whisk attachment, combine yeast, warm water, and 1 Tbsp sugar . Let the yeast get bubbly. Add the rest of the sugar, honey, milk, and 3 1/2 c. flour to the yeast mixture. Beat together for two minutes. Add butter, eggs, and salt. Mix again, well. Remove the whisk attachment and start using the hook attachment from here. Add the rest of the flour a half a cup at a time until the dough begins to separate from the sides of the bowl. Let it rest for 3-5 minutes. Knead the dough in the bowl for 5 minutes. Add flour a tablespoon at a time if the dough seems sticky. Get out a large bowl and grease it with butter. Remove dough from the mixing bowl and place in the greased bowl. Flip it around till the entire outside is nice and shiny. Loosely cover the bowl with plastic wrap and allow the dough to double in size (about 45 minutes to 2 hours, depending on the temperature of your kitchen). Once the dough has doubled, smash it down with your fists (also called “punching”) for about a minute. Roll the dough out to about a 1/2 inch thick. Then fold the dough in half, now making it an inch thick, and roll over with a rolling pin to seal it together. Cut the dough into 2-inch squares using a dough scraper (or whatever you have that will work well to cut the dough). Place the dough on a greased baking sheet, a dozen on a pan like you would cookies, and cover lightly with plastic wrap. Allow the dough to double in size again (about 1 hour). Bake at 350 degrees for 15 minutes, or until golden brown. Immediately rub the tops with a little bit of butter for that fabulous shine. Enjoy! And you can’t make the famous rolls without making Copycat Texas Roadhouse Cinnamon Honey Butter to go with them! Yay! I’m so happy you posted this! We LOVE Texas Roadhouse for this reason! Thanks Alli! I love your blog and I am so excited to try these! Do you use all-purpose flour or bread flour? In a video she said she uses bread flour. Trying this one tonight with the pulled pork that is cooking in the crock pot. Thanks for sharing! Oh good! I hope you like the recipe!! Hi Barbara! Thanks so much for your comment. I made these rolls pretty recently and decided the 36 amount was too low as well and completely forgot to change it on the recipe card. You could probably get another dozen from the dough and have it make about 48. Thank you again for your comment! I’ll change the recipe right away. Anyway to divide it so i don’t have so many leftovers? Or at least freeze portions? That is an excellent question. I’ve never tried freezing the dough, but it seems like it would work to freeze. Someone will have to test that out and let us all know how it goes! But I think it would work to freeze it. I freeze dough all the time. I make all my own bread and rolls I make extra dough and freeze it to use for pizza crust. It works great. you can freeze the dough after the first rise. Punch it down and shape rolls, place in ziplock bags (squeeze out as much air as possiable) and freeze. When ready to use, place on sheetpan, and let rise (this may take a while, and hour to 2 hours). Another option (the easiest) bake the whole batch and freeze (in foddsaver), they thaw in less than 1/2 hour and come out just as good. Trying to make these right now. I am new to making rolls so a few pics may have been helpful and maybe some more descriptive directions. But thanks for sharing the recipe. County Crock makes an awesome honey butter to go on these! Do you beat the first batter until light and foamy, or does it ferment some to get that way? You’ll beat it together then let it sit there till it gets nice and foamy. It doesn’t take too long before you can start adding the rest of the ingredients! Making these tonight with the cinnamon butter we shell see how they come out. My mouth is watering…this looks absolutely delicious and I like your presentations. I use a pizza cutter to cut the rolls into squares after rolling the dough out. This has to be one of the worst recipes ever!!! Baking is very scientific and I just wasted about $10.00 and half my day trying to follow directions that weren’t there. 1. Add enough flour to make a med batter (what does that mean, 1/2 cup 1 cup? 2. Beat thoroughly (how long is that)? 3. Add enough flour to form a soft dough but not all 8 cups, how can there still be 8 cups if I had to add the flour to make a batter. 4.Punch with rage, how long is that and what kind of rage, my unfaithful ex husband rage or rage from just having wasted my afternoon trying to follow directions that are not specific, and now that I have raged out on my dough what should it look like? Gail, thanks so much for leaving your comment and letting me know about your experience making this recipe. I apologize that some of the steps weren’t written very clearly! I’ve gone back through and changed those steps so hopefully it makes more sense now. I’m so sorry you ended up wasting money!! I hope you’ll try to make this recipe again sometime and that it will go much better. Thanks again for leaving your comment! Some times we forget a few steps when we are use to doing something. I think that’s called being human. I’m so glad you took the time to share that recipe. However I did just ask a couple of questions myself. I hope you will be able to answer. I need to know what to grease the pan with and how far apart to place the rolls. Thank you so much! Just made them and the look and smell are right on but the taste was lacking something so I am going to try them next with honey. But all in all they are good. The rolls did turn out very nicely, but I don’t know if I will make them again. It was A LOT of effort, and I normally love baking. I don’t know what I did wrong. I was very careful with it and didn’t want to over work it… the rolls were very dense and doughy.. Not pleasant at all. The recipe seems great, I just don’t know what I personally did wrong to it. I just made these! They are in the oven for the second rise. My only concern is that I only got 3 dozen instead of 5! Do you know what I should have done differently? 95% are the 2×2 inch squares…some maybe be off a little but I don’t think that would have put me off by 2 whole dozen . Either way I am so excited to try these with dinner and I am getting ready to start the cinnamon butter now! Thank you for the recipe!! Have never been to a Texas Roadhouse. But wanted to try these. Oh my goodness these are wonderful! I used the honey and will continue to do so. I think it keeps the texture and the flavor better than most when reheated! Thank you for sharing! In my recipe book already for use during holidays! I married into a family that cooks and cooks, and have never tasted such amazing food in my life, so day is almost thanksgiving and my husband’s mom says, hey, I’ve never tasted your cooking, will you make some rolls for 30 people tomorrow? …..can you imagine how nervous i am? I’m making these but because i made them once for my family and i loved them. Still can’t decide if i wanna try the honey. does it matter what kind of milk? or what size eggs? can’t wait to try this recipe this weekend! 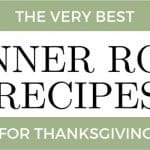 Tried this recipe for Thanksgiving, and they turned out perfect! The honey ads such a perfect touch of sweetness! Thank you so much for this recipe! In baking I always use large eggs. I get fresh milk from an Amish dairyman – but, have used 2% in a lot of my baking. Awesome recipe! It came out great! I cooked the rolls at 325 degrees instead of 350 but all in all, I will be making these again. Thanks for posting! Do you use the honey on top of the sugar or omit the sugar if I decide to use hoey? These turned out fantastic. Thank you so much for this recipe!!! Want to make these, but don’t know what flour to use, plain or self-rising or cake, or whatever? Please someone that has made these let me know. Thank you. Not much of a baker but absolutely love bread in any way shape or form. Hi Margaret! You can use all-purpose flour or bread flour for these rolls. Thanks for the question and for stopping by! I hope you enjoy the rolls! Derek, thanks for the comment! How did they turn out? Maybe I can help you figure out what might have gone wrong. Do you typically use all-purpose or bread flour with these rolls? Tried recipe twice, no rising the first time. 2nd time, got a little bit of a rise, do I kept going. When they came out, they wee very dense, I thought they should be light and airy. Can’t figure out what I did wrong. You had a lot of positive comments, so I presume I am the culprit, but not sure where I went wrong, please help. Thanks for your comment, Christine! There are a few things that could have gone wrong. The first could be the date on your yeast. If it’s old it won’t work like it should. There’s also the possibility that the rolls didn’t have enough time to rise, making them dense. The rising time will vary depending on the temperature in your house. Our house is about 70 degrees and it takes almost two hours for these rolls to rise. The other possibility is that the water was either too hot or too cold when combined with the yeast, causing the yeast to “die.” Please let me know if you have any other questions! I hope that if you try this recipe again you’ll have more success! could I just make these into bread. ?? instead of rolls ? and do the receipe changes ? Hi Diane! I’ve never tried this recipe into a loaf of bread. But if it worked, it would be SO good!! If you try it, come back and let me know how it is! I was at Texas Roadhouse last night and saw several packages of Saf-Instant yeast in the Kingdom of Rolls! When I make them for Easter, I’m going to try the Saf-Instant. It’s available through King Arthur Flour and I don’t have any stores around me that carry it 🙁 One step closer to perfection! Made these today, and I like them even more than the ones from the resturant. Mine came out a bit denser and less sweet than the official rolls, but I actually prefer both of those things so it was a nice surprise. That’s great, Kara! I’m so happy you left a comment. Thanks for sharing! Thanks for the great recipe, but I have just a few questions. What should be used to grease the pan with and how far appart do you place the rolls? Hope I guessed right, because I’m trying them right now. They look great in the pic so if they don’t turn out this time I will just keep trying. Thanks again for the recipe. Hi! Thanks for the comment. Great questions! You can grease the pan with cooking spray or butter, whichever you prefer. And I usually fit about 15-20 rolls on the baking sheet, depending on small each piece of dough ends up being. You can start with a dozen and see how that looks, then add more the next batch if it seems like you can fit more. Thanks!! My only hope is that you consider posting this with weight instead of, or in addition to, volume measurements. It will make this recipe much more foolproof. 1 cup of flour is anywhere between 4 and 5 oz, depending in the compression of the flour in the measuring cup. This recipient is AWESOME! My family has really enjoyed it and I will definitely be making them again! I also tried refrigerating the dough I wasn’t able to bake in my first batch. After 2 days of Bering chilled and baking as indicated, the tools were even better! Thanks again for sharing this recipient! I made these and the dough didn’t really double in size like it was supposed to to. I did everything like the directions said. But I kept on going and they good I was pleased. 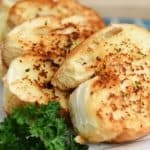 I made some into rolls and the other half I fried for fry bread they turned out amazing for fried bread I will defiantly use this recipe again. Hi Sheena! I’m so glad they worked out for you in the end. That part where the dough doubles in size can take a while. I think it was 2 hours the last time I made them. And I love that you fried them! That’s such a great idea. Thanks for your comment! Mmmm my favorite restaurant rolls are from Texas Roadhouse. I’m gonna pin this to try this weekend! Those rolls look ridiculously delicious! So perfect in every way! I love bread products and this looks so good. Oh yeah…this recipe will get me into trouble. I can already see it. I must try this! In my younger days, we used to go to Texas Roadhouse for peach margaritas and the ROLLS! They are still a favorite when we go. We will be making these soon!! These look really delicious! I have never been to a Texas Roadhouse. I have also not heard of putting honey in rolls so this would be an experiment for me. Hopefully I can get them to come out as yummy as yours look. Hi,just wondering,the recipe says scalded milk but your directions say boil. Scalded milk is heated at low temp till it has sort of a film or skin on top,so that might be why some tries are failing. I want to try this recipe! Sounds so good! Thanks for your comment, Linda! I made the changes in the recipe. Thanks again! Okay so I see that in the directions, I need a whisk and hook attachment but don’t have those just a regular hand blender and a hand held whisk, if I use these tools will my rolls come out the same or will they come out all wrong???? Great question, Brianna! You can still use a hand blender and a handheld whisk, but you’ll be doing more work with the handheld whisk is all. You’ll just have stronger arm muscles than the rest of us! But it will totally work! I use my Cuisinart, the rolls always turn out fabulous. Good to know, Danele! Thanks so much for sharing! Great question, Heather! Yes, the recipe can be cut in half. Instead of doing one packet of yeast, you can either use half a packet or you can buy a jar of yeast and use 1 1/8 tsp. instead. Everything else you can just use half the ingredients listed. Thanks, Heather! Let me know if you have any other questions! Oh my! My boyfriend took me to Texas Roadhouse for the first time last year and ever since then I’ve been looking for a copy cat recipe. I dream about their rolls!!! I’m going to try to make a healthier version of these. I’m not sure it’s possible but I HAVE to try! Yay! That’s great! 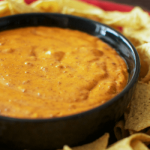 Hopefully you’ll like this recipe. They’re so dreamy. 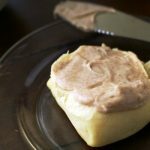 Has anyone tried making the dough in a bread maker on the dough-only setting? Just wondering what modifications to make this work. I made these yesterday as they looked and sounded yummy! 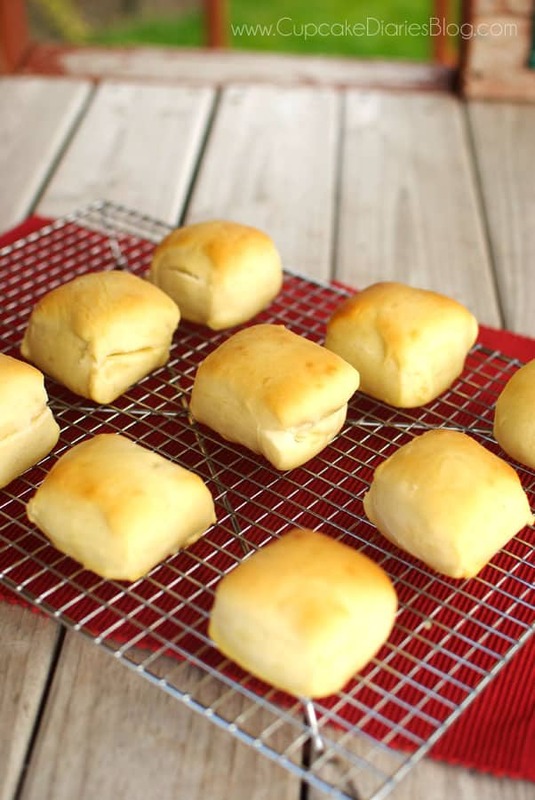 Now I have never had original Texas Roadhouse Rolls,so I cant make the comparison.I had no trouble making them and believe me when I tell you I am not a baker type person! I had no issues with making them and I only used 6 & 1/2 cups of flour. I’m so glad, Laura! Thank you so much for leaving your comment. It makes me happy that everyone loved them! Just wasted an entire afternoon and all those ingredients. I’m sorry, Lisa! This recipe can definitely be tricky. I’m sorry that it didn’t work out for you! 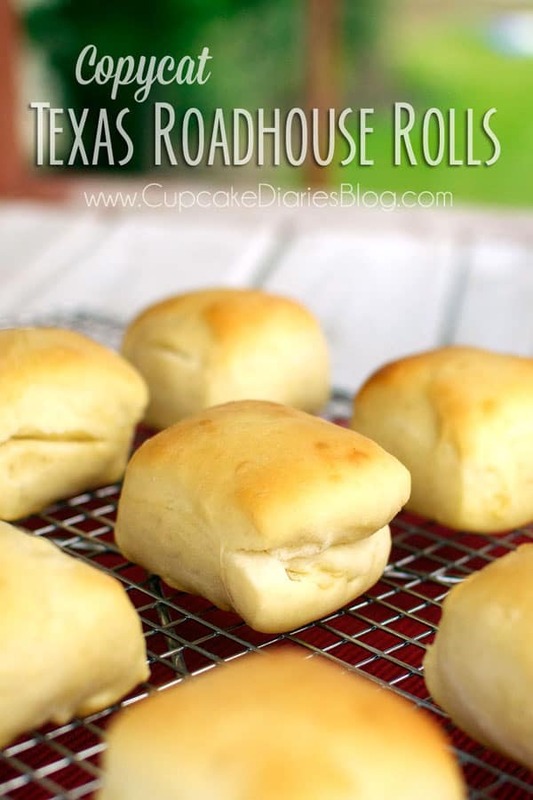 The Texas Road house roll is your basic dinner roll. The sweetness comes from a clear sugar water glaze that they brush on top after baking them. I saw them do this. That’s the way my husbands grandmother did it. tastes just like the way she made them. 1. The temperature of the scalded milk must cool down substantially to avoid killing the proofed yeast, or it will kill the yeast. No active yeast, no fluffy rolls. 2. The method of mixing most/all of the wet ingredients into half of the flour is absolutely brilliant and guarantees great consistency from roll to roll. And is a lot easier for those of us with arthritis. 3. Kneading the dough thoroughly for the wonderful stretchy, bouncy, but smooth texture is critical. These are really great tips! Thanks so much for sharing! And I’m SO glad you like the recipe. Made these rolls tonight and they were absolutely A-MA-ZING!!!! Almost identical to Texas Roadhouse. My family loved them. Thanks so much for a great recipe! Amanda, that’s great! I’m thrilled that your family loved them. Your comment made my day! Have a fabulous Thanksgiving! 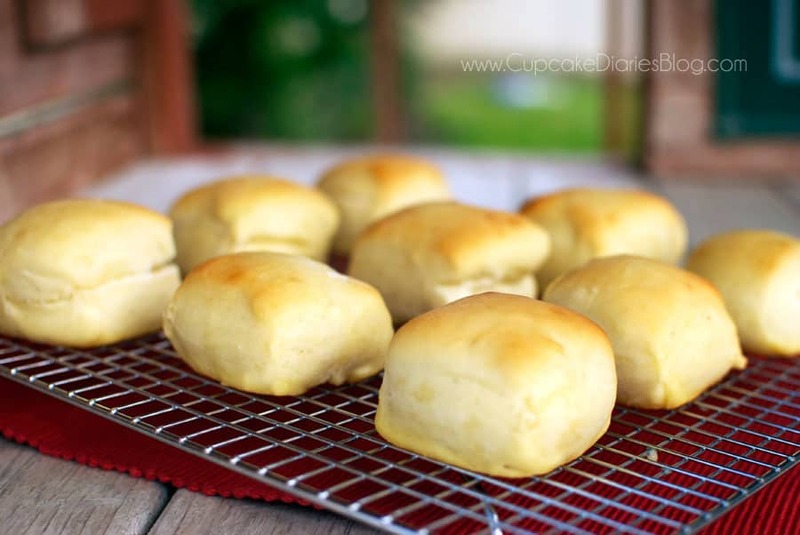 I just made a similar recipe for Texas Roadhouse rolls using my bread maker. They are in the oven on their last rise. 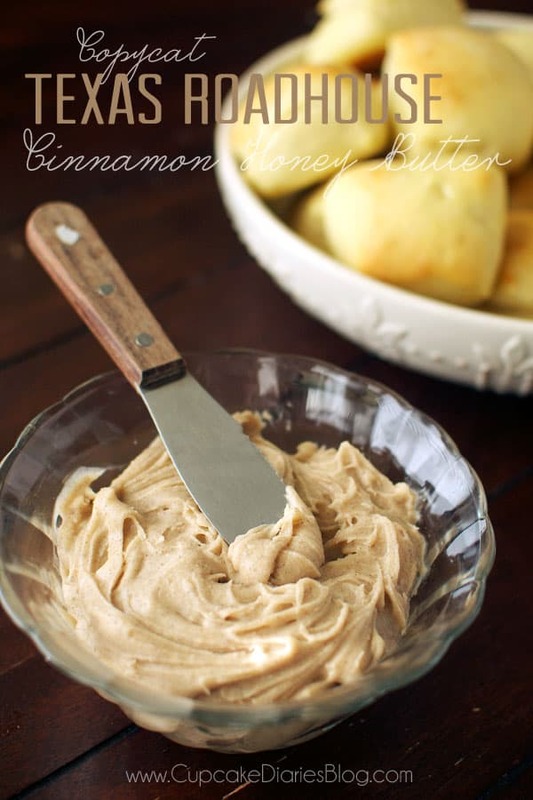 I will be making the cinnamon honey butter to go with them. The recipe I used didn’t call for honey so I don’t know if they will be as good. I’m also attempting to copy their awesome sweet potatoes tonight if I can remember what was on them! Awesome, Marlene! I wish I was at your house right about now. haha I bet it is all delicious!